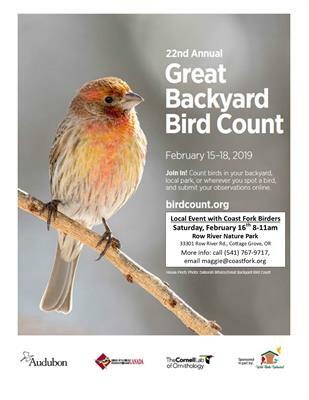 Join the Coast Fork Birders at Row River Nature Park (33301 Row River Road, Cottage Grove, OR) on Saturday, February 16th at 8am for the Great Backyard Bird Count (GBBC). Led by Julie Parker, participants will search for a variety of species, count numbers of individuals, identify gender and breeding status in a nation-wide effort to create a real-time snapshot of bird populations. Results of this citizen science effort will be submitted to the Cornell Lab of Ornithology and the National Audubon Society. This bird walk is open to participants of all birding abilities. 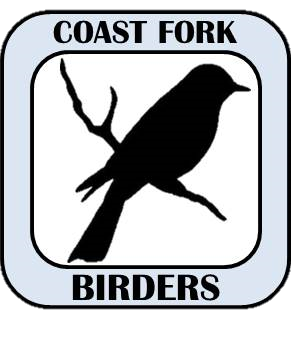 This will be the 7th annual GBBC at Row River Nature Park led by Coast Fork Birders. The terrain is flat at Row River Nature Park and the walk will be on both paved and unpaved surfaces. Be sure to bring weather appropriate clothing and footwear, binoculars, bird identification book, and your own snacks and water. Park in the parking area at the weigh station or in the large parking lot on Row River Road and meet at the entry kiosk by the weigh station. More information can be found online at www.coastfork.org and on the CFWWC Facebook Event Page.